The Walking Dead - S03-E13 - "Arrow on the Doorpost"
We’ve been waiting all season for The Governor and The Ricktator to meet face to face and honestly, now that it finally happened (slightly earlier than I expected), I found it somewhat underwhelming. Sure, the scenes still carried weight and intensity, but I expected a little more fireworks, whether verbal or physical, from this clash of the titans. A nice reveal was that The Governor’s wife died before the zombie outbreak when I think (correct me if I’m wrong) we assumed she died during it. I also enjoyed The Governor’s chilling Cheshire smiles throughout the meeting to contrast Rick’s super serious stares. Last week I mentioned the effort taken to make Michonne more interesting and integrate here more into the group. Well, it turns out that was for another reason than just developing her character for the sake of better television. A better, more likeable character also makes a more interesting trade piece to hang in the balance due to The Governor’s terms. Now that she’s slightly more interesting and Carl likes her, it is easier for Rick and the audience to care whether she gets handed over to Mr. Crazytown Bananapants. While the big boys talked privately, their respective associates bonded outside (except for Andrea, who stewed about her ongoing moral dilemma that nobody cares about). Daryl and Caesar measured their weewees by trashing walkers and then chatted over a smoke. Hershel and Milton discussed scholarly pursuits. Showing that these enemies could very easily be friends just goes to accentuate how insane this war is. Maybe Merle was right about just assassinating The Governor ASAP. One thing that made this episode more effective than the trio of duds before last week (“Clear”) was that it had a clear beginning, middle and end. The episode was about this meeting and the meeting was contained within the episode. Same thing last week: the episode was about going to and coming back from the gun run. Yay for focus. Simple as that. Oh yeah, I almost forgot: Maggie and Glenn made up, shirking their watch duties to get jiggy with it. Good job, kids. What did you think, Steve? Did Rick and The Governor’s meet-and-greet live up to your expectations? It took me a little while to understand what was going on. Not until Andrea showed up did I fully grasp what was happening. At first I thought it was a supply run, then a dream, then an ambush, but everything turned out better than expected. This episode reminded me of the Lemon of Troy episode of the Simpson's. 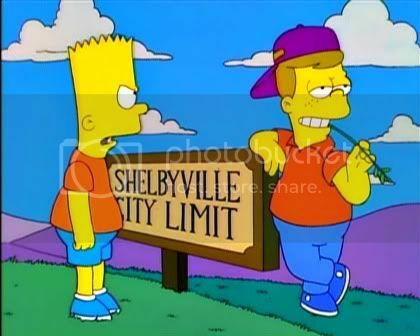 Where the kids go to Shelbyville and meet their dopplegangers. I do hope that Andrea finally sees that nobody really cares for or about her. I did enjoy when she was trying to mediate the discussion and both Rick and The Gov told her to shove off, Take a hint Andrea. I think the different expressions that the two leaders had was very much a show of who they are. The Gov with his big smile, very Joker-esque, and Rick's rather sedated, calculating look, a la Batman, like this. I was a bit confused by the story of his wife. He seemed like he was throwing everything at Rick to see what would work. "I'm here for your surrender" no? "Here is a story about my wife, now I seem more personable, surrender now?" no? "Here, lets share some whiskey!" "surrender? no? "Fine, give me Michonne and we'll call it even." Maybe in another time Daryl and Caesar could have been great friends! I can see it now, the two of them, running around causing shenanigans and destruction...perhaps it is better that they not know each other. Hershel and Milton also seemed to get on well, even though Milton got a bit creepy with the leg stuff. Having the meeting this early, still 3 more episodes to go, I wonder what will happen now. Will they drag out the war until the last episode, or will we be gifted (read: cursed) with a long drawn out chess battle. I just hope Rick doesn't fall into the Gov's trap. I can't see why he would give up his second best warrior. Plus he used to be a cop, interrogations were part of his job. Now I understand that when talking to a sociopath that it is harder to pick up a deception, but come on Rick, you must have some kind of gut feeling tell you not to trust this guy. -I was secretly hoping Rick and The Governor would just call in their comrades outside, break out The Settlers of Catan board game and play for keeps, with winner getting Michonne. -I’m wondering why Andrea, despite even more not-so-subtle hints that The Governor is probably a Sith lord, chose to go back to Woodbury. Is it because she still legitimately sides with him or because she thinks the prison gang is doomed to be slaughtered. She doesn’t push when The Governor doesn’t give her an answer about the terms of his proposal to Rick. Is ignorance now bliss for her? -I too found her lack of interest in what went on a little odd. Perhaps she has some master plan working itself out in the background? Perhaps that is giving her too much credit. -With only three episodes left in the season and a full-on battle looming, I’ve been wondering what the future of The Governor will be? Will he die in the finale? Will he live to see next season and become a long term villain like a Bowser to Rick’s Mario, popping in on occasion to harass Rick’s group? I kind of hope he is defeated but survives the finale and is forced to slink off to regroup only to appear in season five or something. -A comeback is always nice to see. More so if he "dies" in an ambiguous way and no one is really sure if he did actually die or managed to escape. That or he wipes out the gang and the following season's turn into more of a House Wives of Woodbury type of show. Steve’s Episode MVP: Hershel. It takes a talented man to drive a car with only a left foot. Newer PostThe Walking Dead - S03-E14 - "Prey"
Older PostThe Walking Dead - S03-E12 - "Clear"